If nothing else, Alexandria Ocasio-Cortez gives me a lot to write about…and to laugh about. I recently pontificated about her crazy idea to impose a top tax rate of 70 percent, which would reverse the very successful experiment we had in the 1980s (and presumably have a reverse effect on revenue as well). 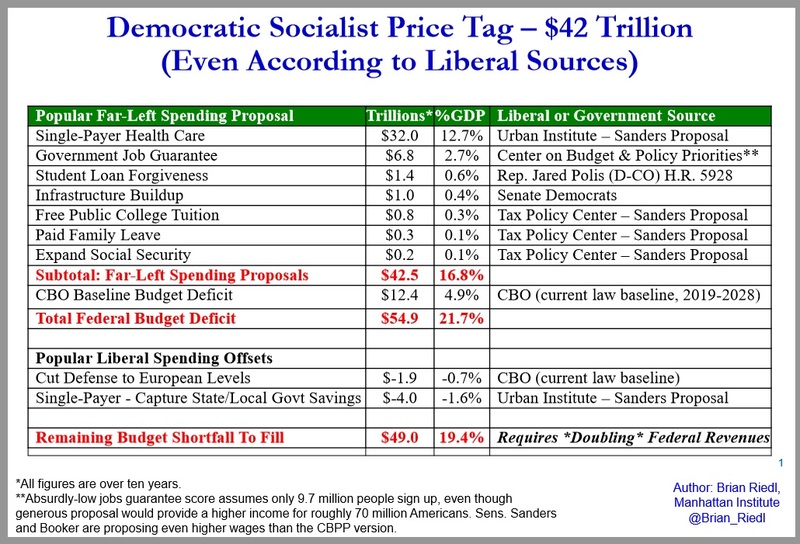 Today, let’s look at the spending side of the fiscal equation. We’ll start with a supporter. Thomas Friedman of the New York Times has a giant carbon footprint compared to the average person, but that naturally doesn’t stop him from endorsing policies that would put AOC’s onerous burdens on the less fortunate. Barack Obama picked up the theme and made a Green New Deal part of his 2008 platform, but the idea just never took off. So I’m excited that the new Democratic Congresswoman Alexandria Ocasio-Cortez and others have put forward their own takes on a Green New Deal… The goal is a ‘detailed national, industrial, economic mobilization plan’ to rapidly transition the country away from fossil fuels and toward clean energy, such as a solar, wind, and electric cars.” The Green New Deal that Ocasio-Cortez has laid out aspires to power the U.S. economy with 100 percent renewable energy within 12 years and calls for “a job guarantee program to assure a living wage job to every person who wants one,” “basic income programs” and “universal health care,” financed, at least in part, by higher taxes on the wealthy. …it is time for the green movement to think big and make big demands…a portion of every dollar raised by a carbon tax in a Green New Deal would be invested in two new community colleges and high-speed broadband in rural areas of every state. Now let’s look at the implications of such policies. But before looking at fiscal and economic considerations, let’s briefly detour to ideology. Jonah Goldberg of National Review has some fun examining the philosophical forerunners of Ocasio-Cortez’s plan. …the Green New Deal…is a triumph of recycling. Not of plastic bags or soda cans, but of ideas. Specifically, Franklin D. Roosevelt’s New Deal and the impulses behind it. To her credit, Ocasio-Cortez (D., N.Y.) is fairly honest about her ideological recycling. …the New Deal itself was largely about war mobilization — without war. Roosevelt campaigned for president promising to adapt Woodrow Wilson’s wartime industrial policies to fight the Great Depression. …Nearly the entire structure of the New Deal was copied from Wilson’s “war socialism.” The National Recovery Administration was modeled on the War Industries Board. The Reconstruction Finance Corporation was an update of Wilson’s War Finance Corporation. …breaking discipline was a punishable offense, which is why a tailor, Jacob Maged, was sentenced to 30 days in jail for charging too little to press a suit. …American liberalism has been recycling the same basic idea: The country needs to be unified and organized as if we are at war… The attraction stems from what John Dewey called “the social possibilities of war” — the ability to reorganize and unify society according to the schemes of planners and experts. Gee, another New Deal. What could possibly go wrong? Now let’s contemplate the practical implications. We’ll start with Warren Henry’s article in the Federalist. …the darling of democratic socialism proposed eliminating carbon emissions within 12 years. …The “Frequently Asked Questions” section accompanying her draft resolution claims it could be funded in the “same ways that we paid for the 2008 bank bailout and extended quantitative easing programs, the same ways we paid for World War II and many other wars. The Federal Reserve can extend credit to power these projects and investments, new public banks can be created (as in WWII) to extend credit and a combination of various taxation tools (including taxes on carbon and other emissions and progressive wealth taxes) can be employed.” …Ocasio-Cortez now falls back on the comforting myth that everything is affordable by soaking the rich with higher income taxes. …Ocasio-Cortez half-concedes her plan is a fantasy… For an idea of how detached Ocasio-Cortez is from reality, consider that we get only 17 percent of our energy from renewables. …even if the golden geese of capitalism were to continue laying eggs in Ocasio-Cortez’s command-and-control economy, there will not be enough to make her statist omelet. Even if Ocasio-Cortez’s fever dream were technologically feasible, the burden of funding it would land on the middle class as well as the uber-wealthy. …This is not the first time Ocasio-Cortez has tried to pass off a fairy tale as a white paper. She recently claimed the $32 trillion cost of a Medicare-for-all plan could be funded by curbing fraud at the Pentagon. Not even PolitiFact could make that math work, given that our nation has not spent $32 trillion on defense since its founding. In an article for FEE, Jarrett Stepman looks at the economics of AOC’s plan. It shouldn’t be a surprise that the avowed “democratic socialist” went with the predictable “tax the rich” formula in order to pay for a massive government program to combat climate change. …such a scheme would mean that her constituents in New York City would pay a max income tax rate of 82.6 percent… Perhaps New Yorkers deserve what they voted for, but does the country? …the tax hikes on the rich would be one of the least radical parts of the agenda. …moving the economy away from fossil fuels to 100 percent renewable energy will come “at a cost of about $5.2 trillion over 20 years.” …this deal would instead rely on the ruthless bludgeoning of private industry and citizens through the levers of the state. …the plan calls for direct government intervention to be its “prime driver.” …The Green New Deal doesn’t just include environmentalist proposals… Among the liberal wish list items included, the Green New Deal contains a proposal for universal health care and a basic minimum income program to make up for all the jobs lost…this will all come with an immense cost. …How do Green New Deal proponents propose to pay for this extreme growth in government? …by massively hiking taxes and then borrowing and ultimately printing money. Then it would use public banks run by unaccountable bureaucrats to carry the whole thing out. …an American version of a Soviet-style five-year plan focused on command-and-control economic solutions that have proven to fail the world over. …The agony of a collapsing Venezuela…is a stark example of how badly this can end. 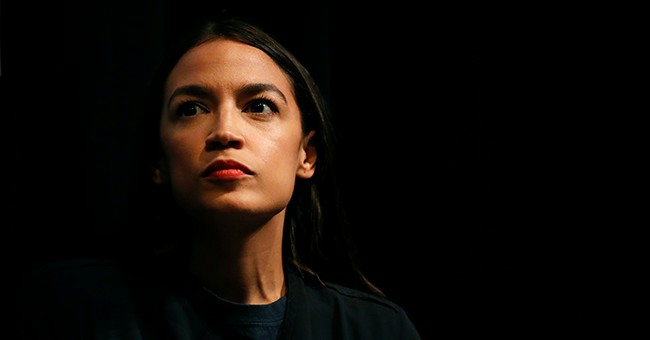 Milton Ezrati’s column in the City Journal further debunks AOC’s numbers. …specific goals…include, among other things, expanding renewable-energy sources until they provide 100 percent of the nation’s power…upgrading every residence and industrial building in the U.S. for energy efficiency…eliminating greenhouse-gas emissions for industry and agriculture; funding “massive” investments… Ocasio-Cortez adds a long list of social objectives: providing training and education for the energy transition, including “job guarantees at a living wage for everyone who wants one”; …mitigating racial, regional, and gender-based inequalities; developing universal health-care and income-support programs… there were some 136 million housing units in the United States. Upgrading each unit to high standards of energy efficiency would cost, conservatively, at least $10,000 per home, adding up to a total cost of $1.3 trillion. Doing the same for industrial structures would easily exceed that amount. The single-payer health-care part would cost another $3 trillion or more, annually. Stabilizing carbon dioxide in the atmosphere would add another $1 trillion to $2 trillion to the price tag—and all these still only account for three items on AOC’s list. …she would rely on debt, “printing money,” and government willingness to take an equity stake in some of the enterprises involved. The bottom line is Ocasio-Cortez wants to dramatically expand the size and scope of government. Some of her ideas would involve big increases in red tape, especially for the green parts of the Green New Deal (thus underscoring why it is rather naive for anyone to think the left would accept less regulation in exchange for a carbon tax). 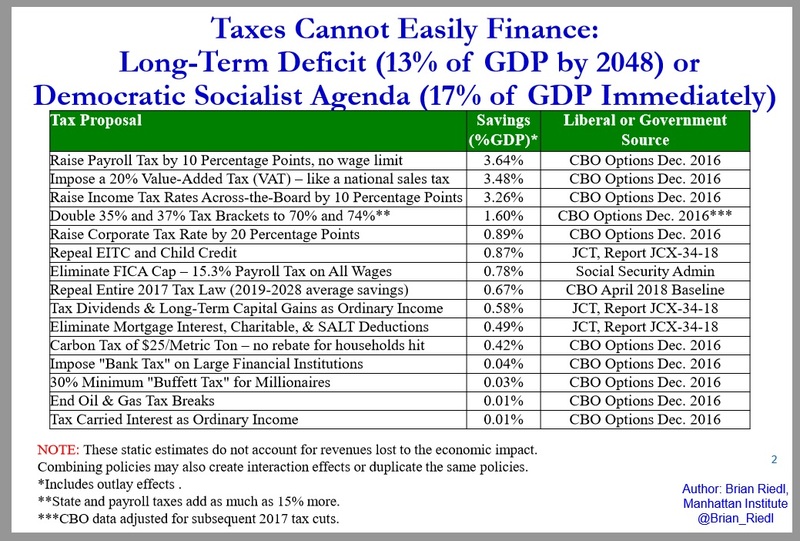 But since I’m a fiscal policy person, I’m naturally concerned about what her grandiose plan would mean for the tax and spending burden. Brian Riedl of the Manhattan Institute has used public sources to estimate the price tag. Here’s the new spending that AOC and her fellow travelers want to impose on the economy. And below we have a menu of potential tax increases. There are two things to realize. First, even if every single one of the tax increases is adopted, it doesn’t come close to paying for AOC’s wish list for new spending. Second, the big revenue sources (payroll taxes, VAT, income tax) are largely taxes on lower-income and middle-class taxpayers. In other words, politicians talk big about screwing the rich, but the rest of us will be picking up the tab. By the way, I can’t resist commenting on this table. I realize Brian is merely following the tradition of budget scorekeepers at the JCT and CBO, but new revenues should not be categorized as “savings.” I would go with “grabbings” or “takings” instead. Brian’s rhetorical sin doesn’t qualify him for the Bob Dole Award or the Charlie Brown Award, but surely there should be some consequences. Maybe we’ll create a Libertarian Re-education Camp and miscreants will be forced to listen to lectures from Dork 1, Dork 2, and Dork 3?